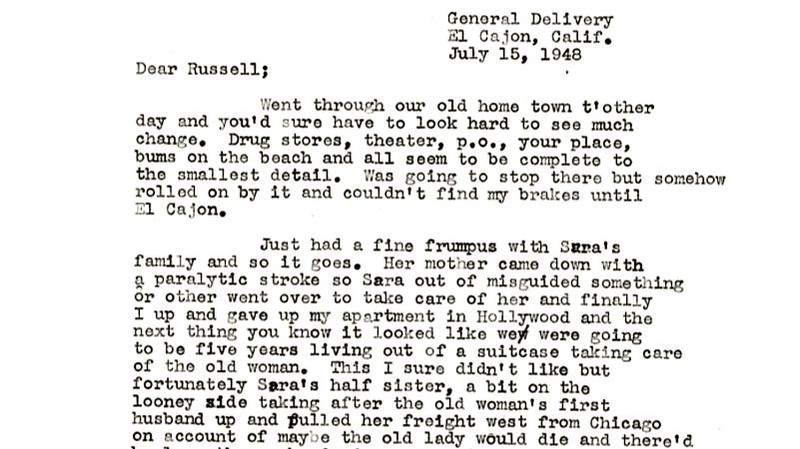 L. Ron Hubbard, the science-fiction writer who launched Scientology, wrote an old Encinitas friend in April 1950 about his hopes for literary wealth. A few days later, “Dianetics” was published — and the controversial religion followed four years later. 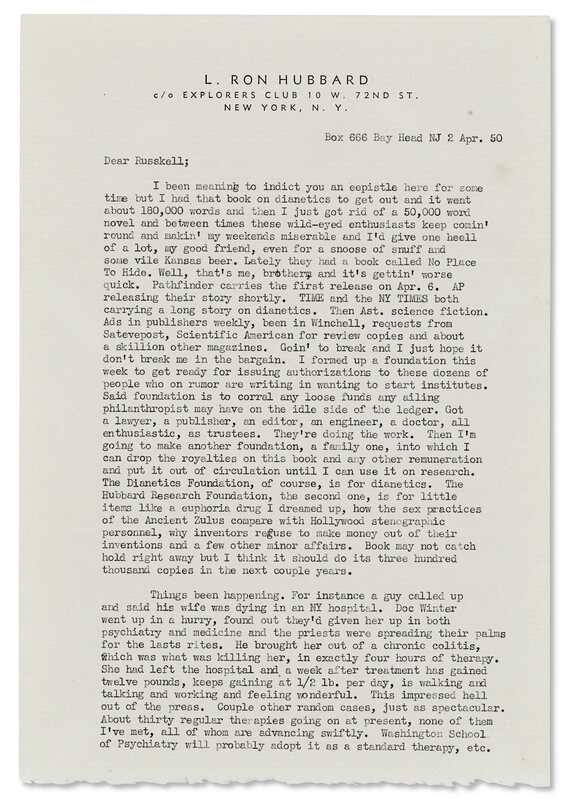 On Thursday, Christie’s in New York will auction a batch of 26 letters from Hubbard to Hays (one sent from El Cajon). 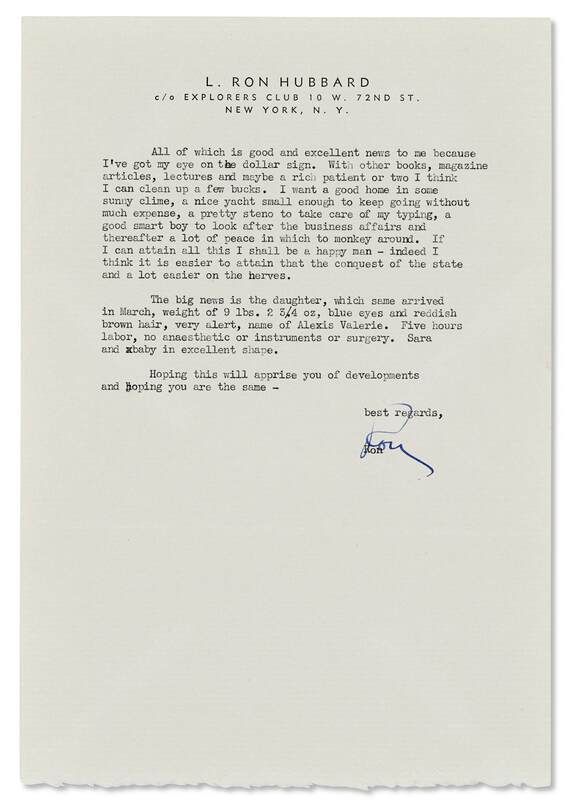 The trove of mostly typed material has an estimated value of $10,000 to $15,000. Peter Klarnet, Christie’s senior specialist for Americana, Books & Manuscripts, said those figures are only an estimate. Ah well, Not at all. The one field Hubtard was pretty consistent is narcissism\sociopathy (total lack of remorse, and compassion), proudly bragging his evil records. in exploiting people in all possible ways of his vicious mind. in fulfilling his sense of purpose, enthusiasm, to meet with a durable feeling of self-identity through his humanitarian activities. I am looking forward to seeing Ron's friends (in the freakzone) to jump on such a nice opportunity to get such a rare fact telling precious asset. Aren't those precious correspondance deserving to be framed and hung up on our Freakzoners friends's Ron wall of fame ??? Terril ???? If needed I can put a few bucks in to help in buying the lot , if to be displayed in this sector of universe Freakzone HGC! I want my Letterz back...and my LP records and their all cracked...I can't see the point of another day, when nobody listens to a word I say. Look at his criminal records! Tous aux abris, il est de retour. My Great-Grandmother was Parisian, so I guess I qualify, mon ami. Tout le monde aux abris, il est de retour. He even has that demented aura and look to him, enough so to actually be who he claims he is. 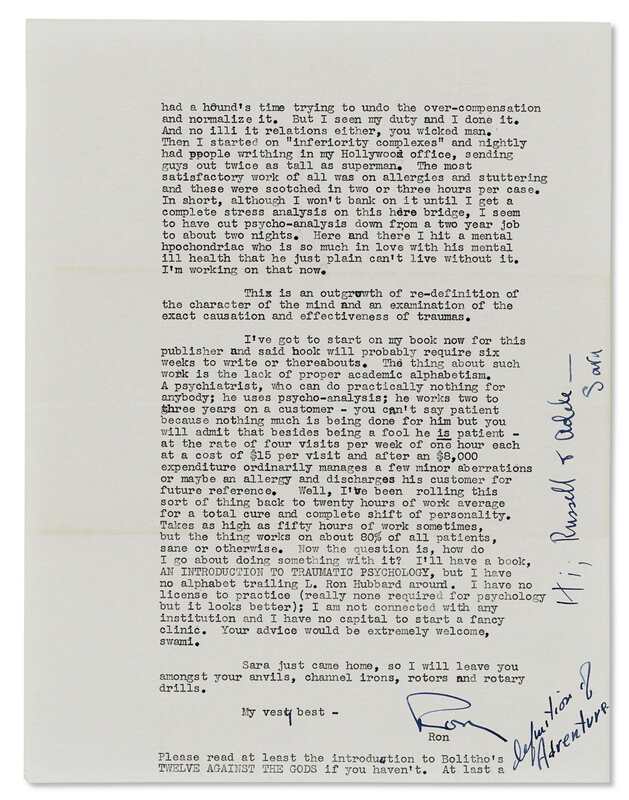 Christie’s auctioneer John Hays (who didn’t note being related to Russell) started the sale at $6,500 in New York City, with bidders also eligible to take part online. Hays saw at least two people raise bids two dozen times, with one jumping in at $15,000. The amounts rose quickly — $16,000, $17,000, $18,000. A $20,000 bid was followed by $22,000, then $24,000, $26,000 and soon $32,000. After a $35,000 bid came the winning “hammer price” of $38,000. 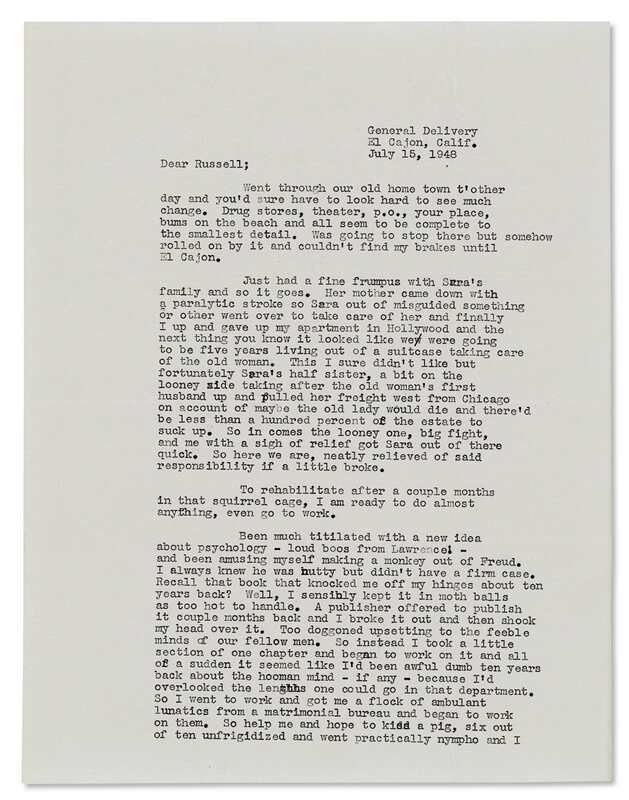 The batch of mostly typed letters in Hubbard’s folksy and sometimes ribald voice had an estimated pre-auction value of $10,000 to $15,000. I dunno. The real Hubbard had a much smoother front. At least he wasn't dumb enough to get a tattoo on his forehead. That really does not inspire confidence. Though certainly a hint of Hubbard's innate sneakiness always leaked through. The letters are an embarrassment to the cherch. In them, Hubbard discusses his own avarice, and more damagingly, refers to Sara and Polly, who’s been written out of his life history. These images didn't come through. Try again as the content would be appreciated. Another reference to William Bolitho (Ryall) and Twelve Against the Gods. It's an excellent insight into Hubbard's "smash his name into history" motivations etc.